By "debriefing" I mean a whole class activity where we review anonymous samples of student work as a class and discuss ways to improve. This is the debriefing for the product "Regents Global 10 Constructed Response ("CRQ"), Frameworks 10.1" which is sold separately in my TpT store. 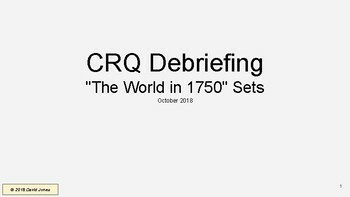 This is a PowerPoint that includes simulated student writing samples for each question of the CRQ I administer at the end of the unit covering NY Social Studies Frameworks 10.1 "The World in 1750". I administer a CRQ at the end of every unit of study. The slideshow includes references to the rubric I use to assess student work on this task in class and notations as to how this is different than the Regents (I needed to develop grading on a scale of 100 for in-class work. I consulted the NYS Global Studies Performance Level Descriptors for this. That rubric is available with purchase of a CRQ). Each slide includes simulated student responses for discussion and scoring. The slideshow has 67 slides. It takes a traditional class period and a half to do this.